This item is currently on backorder. 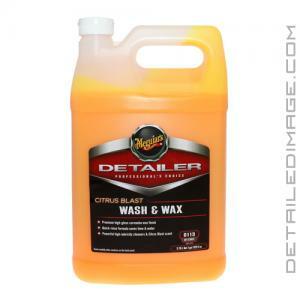 Orders containing this item will ship as soon as we have the 128 oz Meguiar's Citrus Blast Wash & Wax D113 in stock. Estimated ship date: 4/22/19. Save time, washing and protecting in one step! 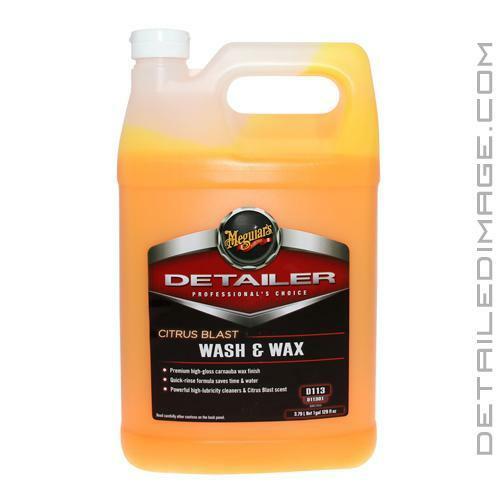 The Meguiar's Citrus Blast Wash & Wax D113 allows you to save time by protecting your paint and cleaning it at the same time! This incredible formula combines high-quality carnauba wax and polymers along with a fantastic shampoo. The unique high-lubricity, lower-suds formula allows your wash mitt to easily glide across the surface, greatly reducing the risk of wash-induced swirl marks. This formula also quickly rinses away while conditioners and wax boost shine and leave behind a slick surface. The protective layer will last around 3-4 weeks, making it a great stand-alone protection product, or a topper to your favorite wax, sealant or coating. D113 dilutes to 128:1 (mix 1 ounce per gallon of water), giving you a great value out of every bottle. Meguiar's Citrus Blast Wash and Wax is the perfect solution for professionals seeking fast and effective washes with the added benefit of wax protection. Specially formulated to clean all of your vehicles exterior surfaces using less time and water thanks to its unique high-lubricity, lower-suds formula that quickly rinses away. Conditioners and wax boost shine and leave a slick surface. Directions: Mix one ounce per gallon of water. For best results, use Meguiar's DMS6000 Metering System for precise mixing and less waste. Wash vehicle. Rinse thoroughly. Professional Tips: After rinsing, remove the nozzle from the hose and allow the water to run freely over the surface. This will allow the water to sheet off cutting your drying time in half and reducing the chance of causing towel scratches.